Dominating the small southwestern English town (pop. 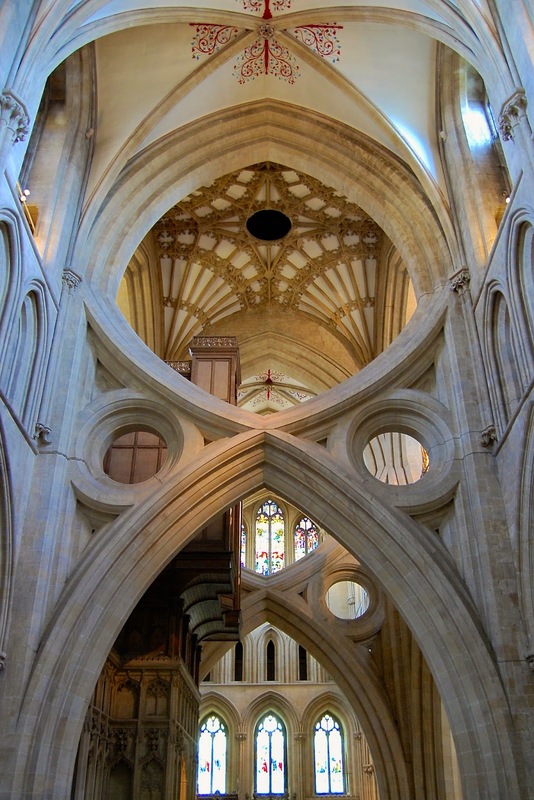 ~ 10,400) in which it's set, Wells Cathedral is the first wholly Gothic cathedral in England. It was built throughout the 1200s — the primary construction was completed in 1306 — but significant additions were made in the following centuries, including towers on the west facade and the lady chapel on the eastern end. So while its general style is "Gothic," the cathedral is really a mishmash of "Early English" Gothic, "Geometric" and "Decorated" Gothic, and "Perpendicular" Gothic, among other subcategories. The west facade of Wells Cathedral is 150 feet wide and 100 feet tall. The initial view when entering the cathedral's green. At bottom center of this picture is an entrance called the "north porch," which was intended as the normal entrance for the cathedral. It's in the relatively plain Early English Gothic style. The central tower, at the top center of this picture, was added to the building in the early 1300s and is in Decorated Gothic style. The original structure wasn't able to properly support its weight, so some ingenuous arches were added inside, as shown in a photo below. Despite some empty niches — courtesy of Protestant troops who destroyed all of the "graven images" they could reach — the cathedral still boasts roughly 300 statues. It is the finest collection of medieval statuary in the United Kingdom. The topmost statue is . . . you guessed it! . . . Christ, supported by the twelve apostles, and then a bunch of other guys (kings, Biblical figures, etc.). Christ in judgment, right hand pointed up in benediction, left hand pointed down to . . . you know where. Twelve apostles stand just below Jesus. Below the apostles are holes out of which trumpets used to play on holy days. Some statues seem to try to hide in the crevices. Did you notice the face peering out in the hole on the right? Inside the cathedral it's light and bright. The skinniness of the nave is contrasted with its height. Remember that really wide facade on the outside? The interior of the cathedral isn't anywhere nearly as wide, so the facade is really what's known as a "screen" facade, screening off the view of the cathedral behind it. The ceiling isn't particularly high, but the skinny width of the nave makes it seem taller. The ceiling was whitewashed in the 1600s. When the Victorians scraped off the whitewash in the 1840s they found one of these flower designs, and decided to copy it all over the ceiling. The most striking aspect of the interior is the enormous "scissor arches" holding up the central tower. While the original cathedral building was finished in in 1306, the central tower was built between 1315 and 1322. Within a short time they realized the tower was too heavy for the foundation, and so the scissor arches were built between 1338 and 1355. Also known as a "double arch," with one arch facing down and one arch facing up, this design helped transfer weight from the sinking western side of the tower to the firm eastern side. Scissor arches in Wells Cathedral. The north transept houses what I think is the biggest treasure in the cathedral: the world's oldest continually-operating mechanical clock. Wikipedia says the clock face was built by a monk from Glastonbury around 1325. I think that's unlikely, however. The Wells Cathedral clock. Below it is a crucifix carved from a yew tree by a German prisoner of war during World War II. The length of medieval hours varied depending on the month and whether it was day or night. That's because the Church, following Jesus's description of 12 hours per day (John 11:9), divided daylight (i.e., sunrise to sunset) into 12 hours, and nighttime (i.e., sunset to sunrise) into 12 hours. Since the length of daylight depends on the time of year — short daylight period on December 21 and long daylight period on June 21 — the length of each of the 12 hours of daylight or nighttime similarly depended on the time of year. On the summer solstice, the daylight hours were each much longer than the nighttime hours. For example, in London on the summer solstice, a daylight hour lasted about 80 minutes and a nighttime hour lasted about 40 minutes. The only days of the year that had 24 equal-length hours were the spring and autumn equinoxes. 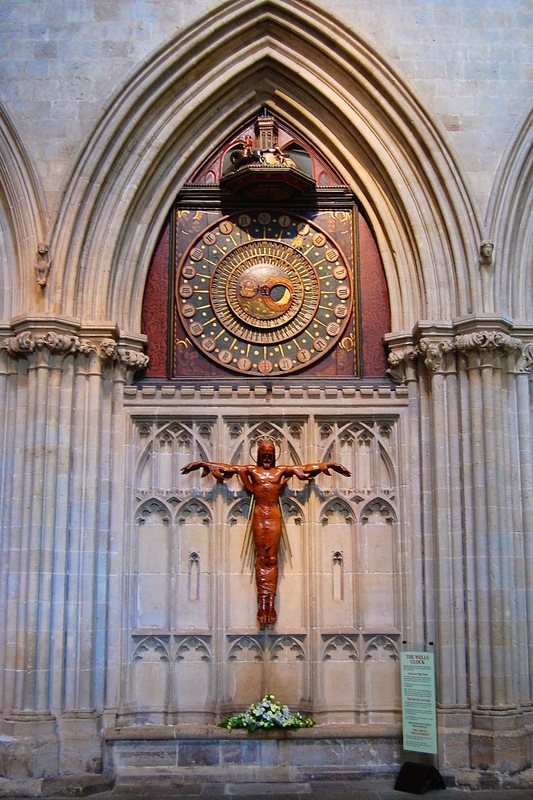 If the Wells Cathedral clock face was actually made in 1325 showing 24 equal-length hours — as it displays in its outer ring — it would have shown the correct time only two days per year (spring and autumn equinox). I'm quite damn sure the clock face was not made in 1325. In fact, the concept of 24 equal-length hours began in Italy in the early 1300s, spread to mainland Europe, and it wasn't until the 1370s or later that the concept of equal-length hours arrived in England. Likewise, the clock's middle ring, showing 60 equal-length minutes per hour, was a concept also not introduced into England until the late 1300s. Consequently, I think the clock face was not built until the late 1300s. The mechanism running the Wells Cathedral clock was crafted between 1386 and 1392, and my guess is that the clock face was created at the same time. That mechanism was replaced in the cathedral in the 1800s, but it was moved to the Science Museum in London where it still operates. Besides the hours and minutes, the clock's inner ring shows dates of the month and phases of the moon. Also, as an added bonus, every fifteen minutes a spinning display above the clock face shows jousting knights getting knocked over. If you look closely (the sun is a little after "II" and there's a dot at the 15 minute mark), you can see I took this photo of the Wells Cathedral clock at 2:15, just after the knights had stopped jousting. In the mid-1400s, they placed a clock face on the outside of the cathedral. It's run by the same mechanism as the indoor clock. The knights toll the bells every 15 minutes. From its installation around 1390 until 2010 — for those of you who, like me, are math-challenged, that's more than 600 years — the clock was wound three times per week by the "Keeper of the Great Clock at Wells." Each winding took about an hour to make 800 turns of the three 550-pound weights that powered the mechanism. The last clock-winder decided to retire in 2010, and they replaced him with an electronic motor. Enough with the clock!, you're thinking. Up a staircase from the north transept is the octagonal Chapter House (i.e., the place where the clergy gathered to hear a chapter of the Bible, as well as to discuss other business). It has a beautiful fan-vaulted ceiling, with the fans interlocking and decorated with carved foliage such as leaves or acorns. Each of the 50 or so monks' stalls are adorned with playful carved heads. Fan vaulting in the Chapter House. Carved heads overlooking the monks' stalls. The heads display a good deal of variation. Crossing the nave of the church, through the scissor arches, to the south transept, is an old baptismal font. How old? It dates from the previous church on the site built in 705 A.D. 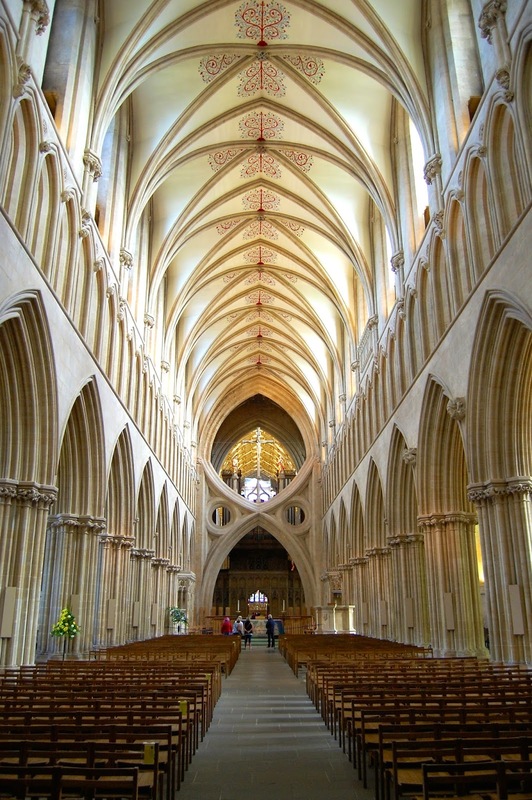 If your kid gets baptized in Wells Cathedral, it's done using the same font as has been used for 1,300 years. 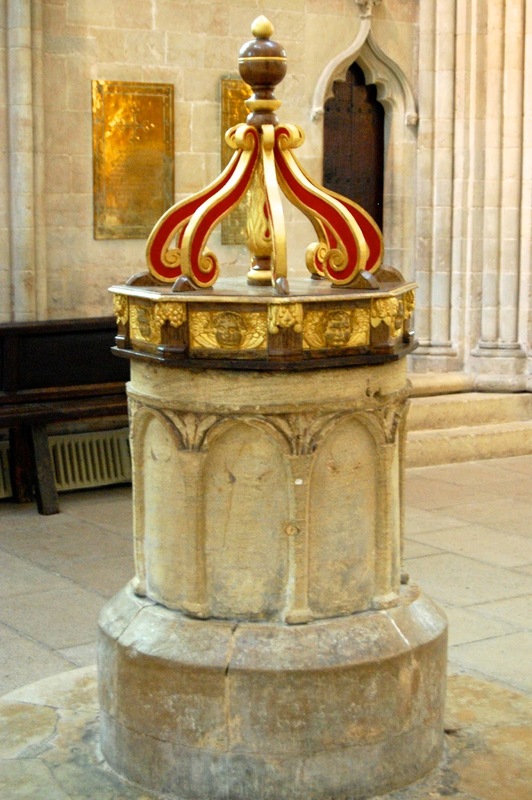 Baptismal font at Wells Cathedral. At the eastern end of the cathedral lies the Lady Chapel (i.e., a chapel added to many cathedrals as the worship of the Virgin Mary intensified during the later medieval period). Its stain glass is beautiful but unusual. In 1685, some Protestants rose in revolt against the Catholic king, Charles II. They smashed the windows at the same time they were tearing down statues from the west facade (along with smashing the organ and stabling their horses in the nave). Some of the windows could be reconstructed, but many of the windows could not. So they put the stained glass back up in a glorious kaleidoscope. Lady Chapel at Wells Cathedral. If it looks a bit asymmetrical to you, you're right; they didn't quite build it correctly symmetrically. They successfully reconstructed these windows. These windows couldn't be reconstructed and so are now a jumble. 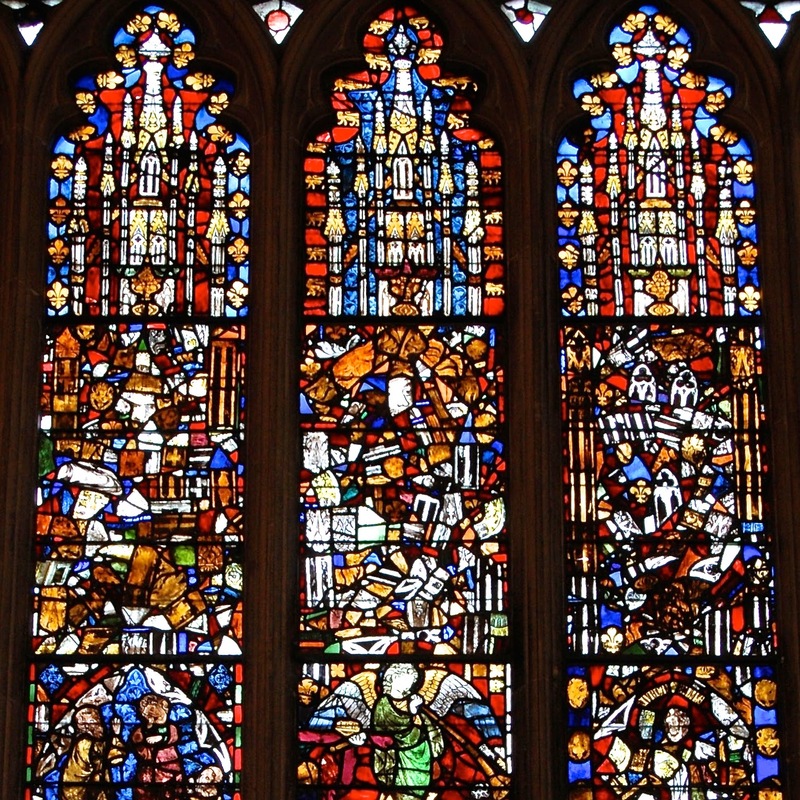 The windows have parts that were reconstructed and others so jumbled they're kaleidoscopic. If you've been reading this blog, you know how I love me some stone carvings in churches, such as in Rosslyn Chapel. At Wells, the best carvings are on pillars in the south transept. They were clearly carved with a sense of humor. One shows a man with a toothache. Another shows a peasant with a thorn in his foot. Toothache, or is he just making a face at us? One sequence of carvings circling around the top of a pillar shows two thieves stealing fruit and the farmer apprehending them. Two thieves steal fruit in an orchard. The farmer captures one of the miscreants by grabbing his ear. The farmer smacks the other thief with his pitchfork. The farmer is so vigorous that his hat falls off. My only disappointment during our visit to the cathedral was missing the world-renowned choir, which was off for a few weeks. They usually sing a nightly evensong concert. The cathedral has had a boys choir for more than 1,100 years. Let that sink in for a moment. They've had a continuous boys choir since 909. That's certainly one of the oldest musical groups in the world. It currently has 18 boys, aged eight to fourteen. I believe they have a full private school education provided in compensation for their service. The cathedral added an adult male choir in the 12th century. They got around to adding a girl's choir in 1994. The joint boy and adult male choir is one of the best choirs in the world. 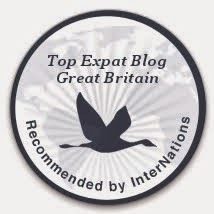 It has a recording contract and tours around the world. I'm determined to go back to Wells just to hear the choir. 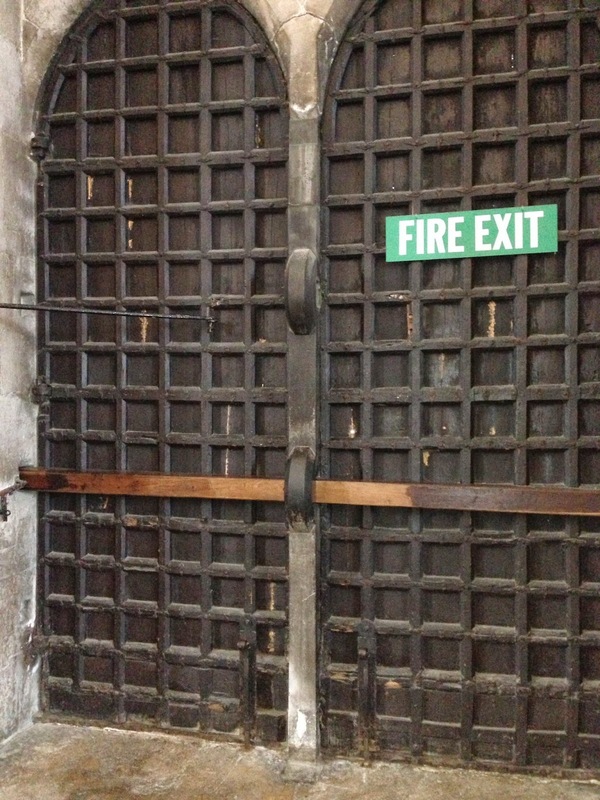 I hope your fire allows for a slow, relaxed exit. You'll need to unbar the door, pull up the posts stuck into the ground, and then release the metal bar hooked into the door. We also quite liked the cloisters. They were striking visually, as you can see below. Really, it's just a square hallway with a courtyard in the middle. What makes them odd is that the cathedral was not monastic and so it had no actual need for cloisters. There were no monks to keep sheltered away from the world. In fact, they have no real explanation for why the cloisters were built. Wells Cathedral is not the most prettified of churches, but it has a number of very interesting elements. This is a cathedral to be savored for its many constituent parts. We found it fascinating.